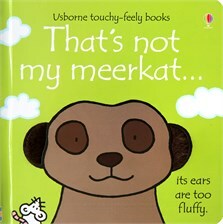 There’s a mob of cute and curious meerkats to meet in this colourful touchy-feely board book, perfect for young animal-lovers. From smooth noses to tufty tails, little fingers will love feeling the different textures on every page as they look for their meerkat. Even on the title page readers get to touch the pictures. I kept going back to the fluffy tail because it feels so soft!